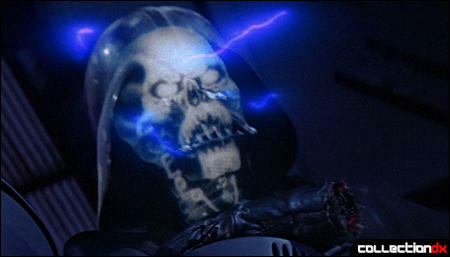 As the name would imply, the Emperor's Wrath Darth Vader is meant to recreate the force lighting effect of Emperor Palpatine electrocuting Darth Vader at the end of Return of the Jedi. This variant is an exclusive to Walgreens stores. Being that this is a variant of an already released figure, I will keep this review short and just try to highlight what makes it unique. This variant comes with a new translucent helmet with visible skull and a removable right hand. Aside from that, this release is essentially the same as the standard Black Series Darth Vader, except that this release comes in the new black and red Force Awakens box. Additionally, the new head makes this Vader just slightly taller than the previous release. As with the standard release, E.W. Vader has very nice articulation. He has a wide range of motion in his hips which allows for some nice dynamic poses. All of the buttons and switches on Vader's suit are painted and look nice and crisp. The skull that is visible underneath the translucent mask has force lightning effect painted on it. 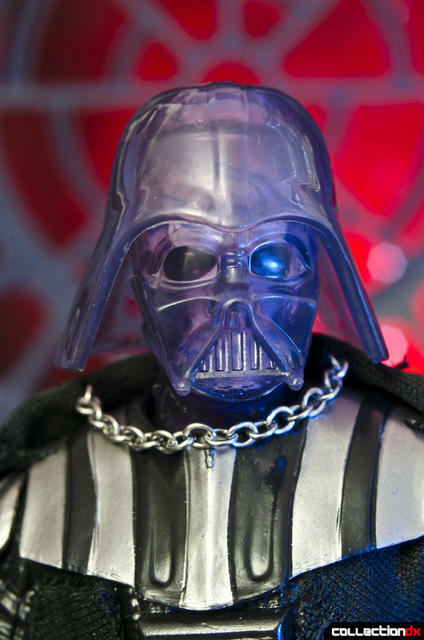 This version of Vader features a removable right hand that when removed, exposes painted wires underneath. This new hand simply pegs in rather than being on a universal joint like the standard hand. That means there is a little bit of lost articulation, but it’s not sorely missed. This version of Vader comes with the same soft goods cloak and red light saber that the original came with . So, is this version of Vader a mandatory buy for Star Wars fans? Probably not, but it is an awful lot of fun. Are there larger versions of the pictures? These aren't the pictures you're looking for. I've seen Black Series Palpatine maybe three times in stores, so the next Walgreens exclusive should be a cackling version of him, maybe with an extra "Super Creepy ESB Lemur-Eyes Head" as a bonus. Around here you almost never see any 6 inch black series besides slave leia. Saw Han a couple times,Jabba and the Speeder bike are prominent I guess since they're more expensive,and I've seen the Irish dude's red armor henchman like once. If I were collecting this line it would be all online. Slightly OT, but am I the only one that was ever bothered by the lack of a support/skeletal structure on the end of Vader's arm when his hand was cut off? There just a tangle of wires. If you cut off a T-800's arm, you'd see some kind of support for the arm. That always bugged me. Perhaps he is like a crab, with the outer shell being the support structure, and the inside being all bionics?